Why are telephones needed at signals? 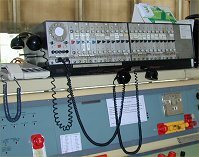 The need for a telephone at signals can be traced back to a requirement of the Railway Companies' Rule Book. This was introduced following the enquiry into a crash at Norton Fitzwarren on the main West of England line of the Great Western Railway in November 1890. "When your train is detained on a running line at a signal at danger, or without a movement authority (MA), you must contact the signaller as soon as possible. However, you may wait for up to two minutes before contacting the signaller if you can see an obvious reason for the signal being at danger...."
"You must contact the signaller by using the train radio. If it is not possible to use the train radio and a signal post telephone is provided, you must use it to contact the signaller.... "
The signaller must only be able to talk to one driver at once. The signaller must at all times be aware of the identity of the calling party. There must be no overhearing, so that one driver cannot hear instructions intended for another. It hardly needs adding that speech must be sufficiently lound and clear that instructions can be passed without misunderstanding. The simplest implementation of a signal post telephone is the point-to-point link. This could typically have been achieved with a local-battery, magneto-calling telephone at each end. All of the safety requirements are readily met since the circuit is completely separate from all others and the telephone at the signalbox can be labelled clearly with the signal identity. This simple system is only suitable for small signalboxes with very few signal post telephones. Additionally, local-battery telephones are a maintenance liability, needing frequent battery changes - especially if they are left off-hook. A reminiscence received from Paul Hepworth: " The long haired signaller at Wood Green is Jimmy Brown. 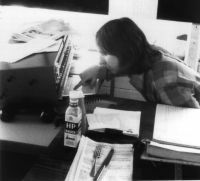 When the 13 stagework block bells on the shelf above the panel were temporarily wired pre-commissioning, to ring back on themselves for testing, Jimmy discovered how to play a church bell peal on them with the panel bell pushes!" Concentrators were constructed on similar lines to office switchboards, using Post Office keys and switchboard lamps, but various steps were necessary to achieve the safety requirements. On a normal office switchboard, if the operator throws two speak keys at once they can speak to both extensions served by those keys. To prevent this happening on a concentrator, the principle of 'chain-locking' is employed. When a speak key is thrown, break contacts operate to disconnect the circuit immediately adjacent in one direction. This break contact wiring is daisy-chained along the speak keys from first to last, giving an order of precedence to keys, either left-to-right, or right-to-left. Chain-locking satisfies the first safety requirement. The second requirement is met by providing a lamp indication and label with each key to show when that circuit is connected to the signaller's handset. The third requirement of no overhearing is met by careful design and construction of the concentrator so that cross-talk between circuits is minimised. Signal post telephones are lightly used compared with office telephones since they are only needed when a train has been stopped at a signal. Therefore it would appear wasteful to provide a separate pair of wires to each signal when it is unlikely that more than one telephone will be in use at any one time. Apart from junctions, signals are positioned at regular distances along a railway track in order to keep the trains suitably separated. It is therefore attractive to use one pair of wires along the railway track to serve the telephones at each signal down the line controlled from the same signalbox. 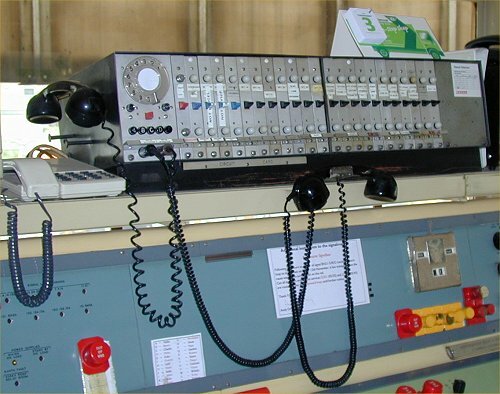 Looking back at the safety requirements, if all the telephones are connected to the same pair of wires, how do we distinguish which telephone is calling the signaller? Furthermore, if one telephone is in use, how do we stop the other telephones overhearing the conversation between driver and signaller?